Yes, you all can breath a sigh of relief. Unlike other Web 2.0 applications, I just can't get into Twitter. I try, I really do but unlike other areas that friends consider time wasters (like Second Life and Blogging) and I don't, I can't find reasons to Twitter. That's not to write that it doesn't have applications, because I think it does. The idea of having an instant messenger platform that broadcasts what you are doing to anyone that can catch your posts has applications especially if you are someone famous. However, for the average Joe, I can't see how it would be interesting. Its just not something I care about. Do you really want to hear that I just got back from my son's t-ball game or that I'm pounding through my RSS feed? I'm sure you'd be interested in what I'm working on for a certain Presidential candidate, but I can't print that or anything else for any of my clients that you would find interesting. Sure, most of these posts are no more or less interesting than what you would find in an instant messenger exchange, but at least those are people that have an interest in, well, me. Sure there will be a big news event that is broadcast on Twitter first and that will score big points in the community. And, perhaps as a widget resting on your blog or website it will have some utility (I haven't added one yet) similar to the del.icio.us tagging that gets published to this blog, but as some major new platform, I don't see it yet. Plus, I wonder if it is really starting to twitter out. 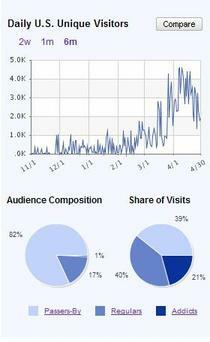 I pulled this chart from Quantcast and the trend for April is heading south and 82% of the visitors are just passing by. If you find use out of Twitter than more power to you, but for me I'll just keep slogging away at it. If you are following someone interesting and want to know what the are doing at this exact moment, than Twitter is obviously for you. However, for me, I have enough average American moments every day that barely keeps me awake while I'm performing them, let alone publishing so they can act like sleeping pills for you. Twitter feels more like a simple add-on tool to be bought by a blogging platform or something like Technorati rather than a new world changing platform. This is the nice information. I also want to suggest one online advertising network to you - Hooqy.com. It pays 10% of referred advertisers' expenditure and 5% of referred publishers' earnings. Publishers have full default campaign management to manage their unsold space. Monthly payments by check or Paypal with $50 payout.